100 Watt Soldering Irons & Accessories - SAVE! To put tool kits into your shopping cart, enter the quantity and press the "Place in Cart" button. Click "View Shopping Cart" in the top right corner of any page to review or change the contents of your shopping cart. This stained glass soldering iron is our most popular - a very good quality 100 watt soldering iron, designed for stained glass and other uses - at a very good price. The 'Choice' brand iron develops a 1100 degree temperature, has a well insulated handle and a general purpose 1/4" tip that works well for most soldering jobs. Soldering iron is 10" long, with a 5" handle and 5' cord. Iron is 110 volt with standard 2-prong plug. Stand pictured above is not included. To control heat for best stained glass soldering, AmeriGlas recommends that a temperature controller be used with this iron. The 100 watt soldering iron develops a 1100 degree temp which is perfect for some jobs but it can be much too hot for other projects. Various sized replacement tips are also available, below. SAVE - On-Line SPECIAL $28.75! Inland's deluxe 100 watt soldering iron was designed for stained glass crafters. The stained glass soldering iron delivers heat to a 1000 degree temperature. A premium iron with a comfortable handle. Iron comes with general purpose 5/16" tip. The 100 watt soldering iron is 10" long with a 5" handle and 5' cord. The Inland 100 Watt Deluxe Soldering iron is 110 volt and has a 3-prong plug. Stand not included. Various sized replacement tips are also available, below. 100 Watt soldering irons provide more heat than most soldering irons - great for larger projects. However, the heat can often be too much when working on smaller jobs. To control heat for best all-around soldering, AmeriGlas recommends that a temperature controller be used with this iron. Temperature controllers are also available on this page. Get a smooth, cleaner bead with an adjustable 100 watt temperature iron. The Inland TempTrol soldering iron has a built-in solid state electronic temperature controller that allows you to vary the iron temperature from 200 to 1200 degrees F. Easy-change nut holds 3/8" tip. Soldering iron is 10" long with a 5" handle, 5' cord and 3/8" tip. Includes small aluminum stand, shown above. One year manufacturer's warranty. Various size replacement tips are also available, below. 110 volt with 2-prong plug. Note: TempTrol tips also fit the Inland StudioPro model soldering irons. Professional quality soldering iron is small and light-weight to eliminate hand fatigue. Modern ceramic heater design provides 100 watts of quick heat recovery and maintains a constant 850 degree temperature. Iron is designed for stained glass projects or for general soldering work. The soldering iron comes with a 1/4" tip and can be used with a temperature controller if variable heat is desired. The TempTrol soldering iron is 8" long with a 5" handle and 5' cord. Includes small aluminum stand, shown above. Comes with a one year manufacturer's warranty. 110 volt with 2-prong plug. Various size replacement tips are also available, below. A quality temperature control unit at a very good price. Allows adjustment of iron temperature for the needs of small and large projects. Can be used to control the heat of any soldering iron - from 0 to 100% of the soldering iron's designed heat capacity. Solid-state circuitry. Soldering iron plugs into the top front of temperature control unit, which has a 5' cord. Three-prong outlet on controller accommodates any soldering iron as the unit is rated to 400 watts. The unit uses 110 volts and has a 3-prong grounded plug. SAVE - Mfgr Reg price $34.95 On-Line SPECIAL $28.75! Inland's solid-state temperature control unit allows adjustment of soldering iron temperature for the needs of any sized projects. Soldering iron plugs into the back of unit, which has a 5' cord. Three-prong outlet on controller will work with any soldering irons. 110 volt with 3-prong plug. Other Temperature Controllers available, above. Heavy-duty soldering iron stand keeps your iron handy while avoiding mishaps. The heavy weighted base weighs 2 lbs and holds the iron without tipping. All metal with spring style holder and ceramic cap. 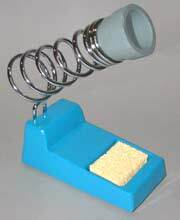 The soldering iron stand includes sponge tip cleaner in center of base. Perfect for use in enclosed work areas. Active charcoal filter traps soldering fumes. Small 5"x 5"x 6" steel case easily fits in your work area. Fume Trap comes with one filter. Replacement filters are also available in a 3-pack, below. 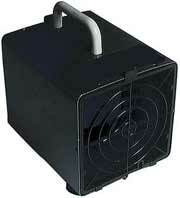 The Inland Fume Trap is 110 volts with a standard 2-prong plug. Gets rid of clutter by holding your tools, foil, iron - everything. 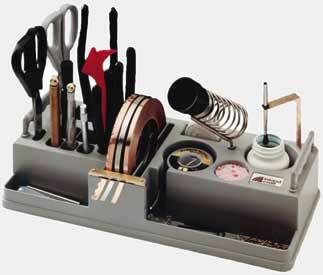 Made of high-impact plastic, this station holds all the tools you use to create stained glass projects. Station is designed with built-in soldering iron holder and foil dispenser plus slots for fid, burnisher, pliers, cutters, solder and other tools. Plus, the pop-up handles make it easy to move around. You'll never misplace a tool again!  Water-soluble flux from Glastar does not corrode or discolor. Use for lead, brass or zinc came or for copper foil. Considered the best water-rinse product on the market. 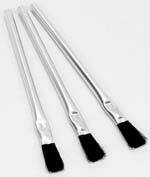 Brush is ideal for applying flux, patina, etching cream, and other chemicals. Brush is 6" in length with brush width of 3/8". Keep your soldering iron tip clean and free from carbon with a Sal Ammoniac tinning block. Just clean your iron with fine steel wool, apply a small amount of solder and rub the iron tip on the tinning block. Cleaned tip will now hold onto solder for faster and more efficient soldering.